School started this morning so the race has begun. I was up earlier this morning trying to make sure that the kids got to school on time and hubby made it to work on time. Summer vacation is over and now every minute of every day counts more than ever before. This lip smacking good Hamburger Steak with Country Gravy is so quick to come together. 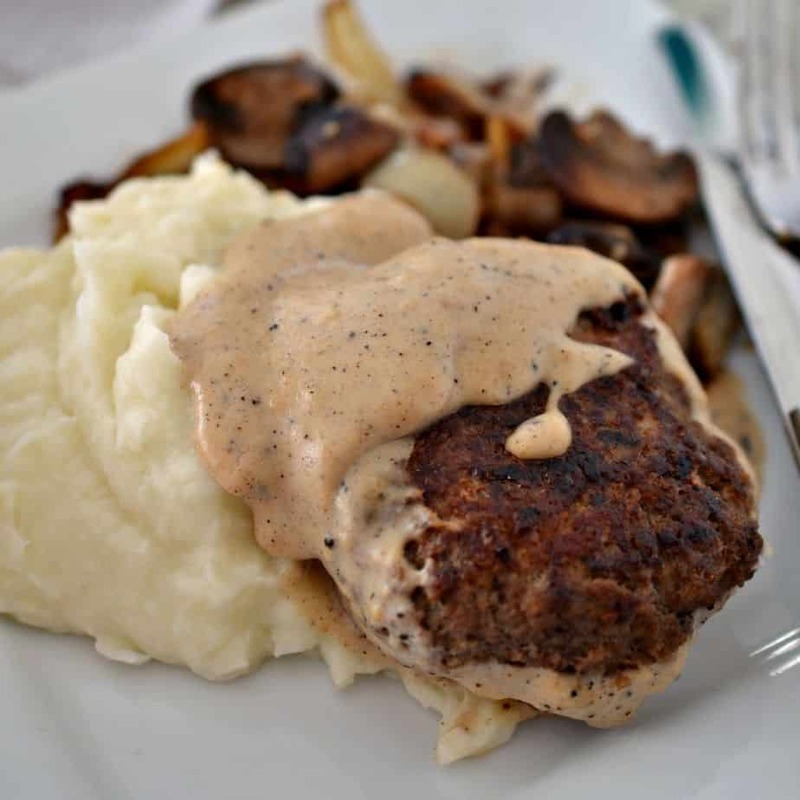 These Hamburger Steaks with Country Gravy are a family favorite and even my picky son loves it. Are you finding yourself stretched thin already? Have you tried any of my other easy quick recipes? 30 Minute Stuffed Pepper Soup, Ham Swiss Parmesan Crescents and One Skillet Savory Beef Tips and Gravy are just a few on my favorites. You can also sign up for recipes via e-mail. On my home page at the bottom is a follow button. Enter your e-mail and you will receive my new recipes via e-mail. This may help you stay on track this school year. No worries, I got this covered. 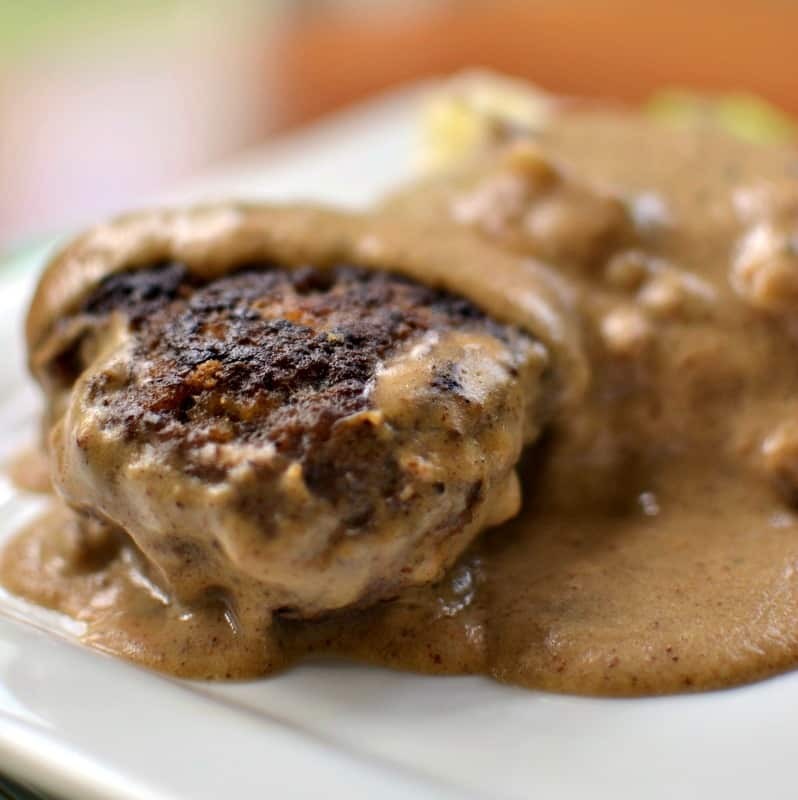 This delectable Hamburger Steak with Country Gravy combines ground beef patties, bread crumbs and a perfect blend of spices in creamy country gravy. These patties are onion free making them super kid friendly however if you like onions please feel free to add them. This recipe comes together in about thirty five minutes making it a weeknight doable recipe. I like serving it with mashed potatoes but Amish egg noodles are delicious as well. You can also serve right on hamburger buns or with soft rolls on the side. 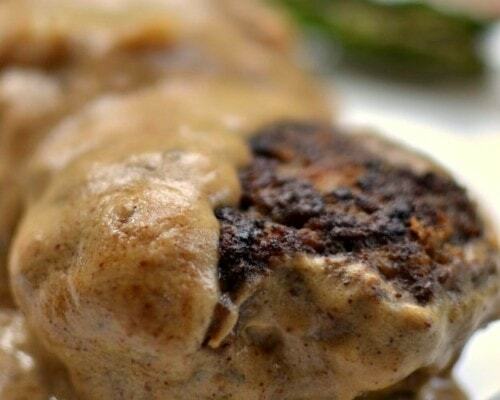 How to prepare Hamburger Steaks and Gravy. These are so easy to prepare. You are going to mix your ground beef, bread crumbs, egg, Worcestershire sauce and spices in a big bowl. Shape into patties and cook in a large skillet with a little oil. Once browned remove to oven proof plate and place in oven to finish cooking while you make the gravy. In same skillet over low heat melt enough butter to have four tablespoons of fat. Whisk in flour and spices. Cook until browned and fragrant; whisking continuously. Whisk in milk and simmer for a few minutes until slightly thickened. Add patties back to the pan and warm. It is just that simple and delicious! It is the perfect family meal and a great recipe. What types of ground beef are best for Hamburger Steaks? Any type of ground beef will work but I like to cook with either the ground chuck or ground sirloin. Both chuck and sirloin work as the patties will not stick to the skillet and they do not produce an excess amount of fat. Butter works best with the flour when making a roux so keeping the beef fat to minimum works best. 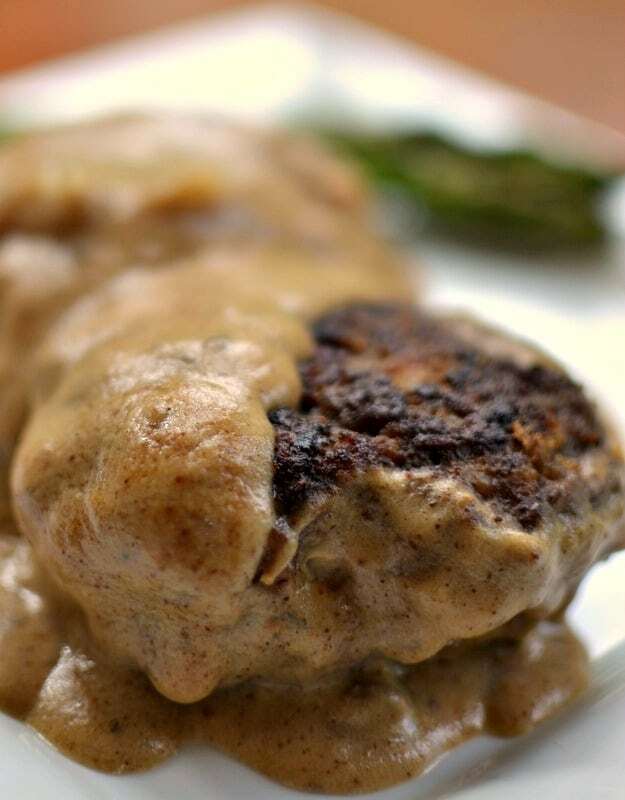 So if time is becoming very precious yet you love the idea of making home cooked delicious lip smacking good recipes for your family than this Hamburger Steak with Country Gravy is right up your alley. Your family will be singing your praises and asking for more. Ground beef is a staple around here. It is relatively inexpensive, versatile and easy to work with! Here are some more Ground Beef Recipes. This post was originally published August 16, 2017 and was republished March 3, 2019 with new content. In large bowl mix together beef, bread crumbs, egg, Worcestershire sauce, black pepper, salt, onion powder and garlic powder. Shape into six patties. Heat oil in large skillet over medium heat. Brown patties on both sides; approximately 4-5 minutes per side. Remove patties to oven proof plate and place in oven at 300 degrees for 15 minutes. In same skillet over medium low heat melt butter. Whisk in flour, cayenne, garlic powder and onion powder. Continue whisking until golden brown and fragrant; about 7 minutes. Slowly add milk whisking continuously. Simmer until slightly thickened; approximately 2-3 minutes. Gravy will thicken more upon cooling. Season with salt & pepper to taste. Add patties back to the pan and simmer for 2-3 minutes. Serve over mashed potatoes or egg noodles. For the gravy add enough butter to the skillet to have 4 tablespoons of fat including the fat from the hamburger. I so enjoyed checking out your page, your food looks great and I know my nine year old granddaughters will love making some of your passion. Thanks so much! Sounds like you and your granddaughter know how to have a great time!! This is a very delicious and comforting easy recipe. I am making it for the second time today. It’s a winner, winner hamburger dinner. We love it! Thanks Wendy! So glad that you like it! We love it too!! This looks so delicious!! I’ll have to give them a try next time I have access to a kitchen. That would be great. I hope you get to try them soon. You will love them. My husband would love this! Maybe I’ll surprise him and make it for him this week. I go crazy for hamburgers! Thank you so much for this recipe. The people in my household are gonna love this so much. I sure hope they do. We had it the other night and loved it yet again! LOL! Looks delicious. Going try the recipe out when I have the time. This looks like an extremely delicious recipe. I miss out on so many beef based dishes. Thought. Am veg but this dish looks so delicious. I shall show it to my non vegetarian friends. That is fantastic! I am sure they will absolutely love it! I feel like this is the kind of meal my boyfriend will love and I won’t actually mind making. I’m not a big fan of cooking but this seems super simple so I may give it a try! I sure hope you do! It is delicious and he will love it! The perfect family meal. This is making me hungry. I will give it a shot and let you know how it goes. This is fantastic! 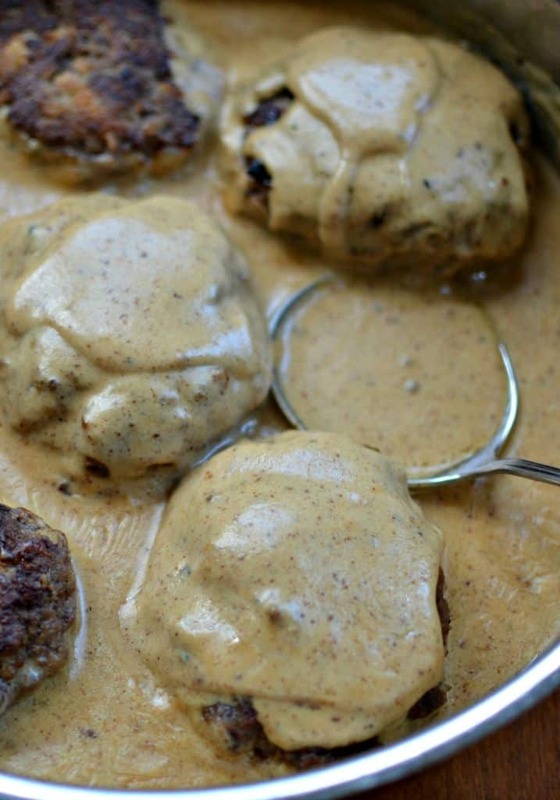 Been looking for different ways to prepare ground beef and I didn’t think about hamburger in gravy! So good that you shared this simple recipe! My pleasure! I sure hope you enjoy the recipe! I love hamburger steak! It’s a staple for me. Also, the gravy makes it extra special! The country gravy sounds absolutely delicious! I would definitely use this vegetarian-friendly ‘sauce’ on egg noodles, with some sautéed mushrooms and onions. So yummy! That looks seriously delicious! I would love to make some of this for the family! This would be gone in record time at my house. With two sons who are both voracious eaters and a husband who loves his hamburgers, I am positive this dish would be another win in my house. Thanks for sharing the easy to follow recipe! I have a hamburger steak recipe from my mom but it doesn’t have gravy, so I had to try your version! We loved it!! I could eat this gravy with a spoon! Awesome flavor! Sharing this recipe with all my family and friends! So good. It was a huge hit at my house!! Really amazing! I tried this recipe yesterday and it was great most of us. To me I like things with more spices, not necessary hot, so next time I am going to improvise a bit. I am happy that my finicky daughter liked it. she is mostly a chicken person. I am so glad that your daughter liked it. I like a little more spice too but sometimes I have to cook things that are a little more tame.